Starring: Chadwick Boseman, Harrison Ford, Nicole Beharie and more. The “biopic” genre is always an interesting one. Focusing on the events of an individual’s life in a particular time period and presenting the importance that individual or his accomplishments held in the lives of countless others around him and to come, many people have been deserving of the “biopic” treatment. Biopics of historic figures such as Alvin York (Sergeant York), George M. Cohan (Yankee Doodle Dandy), Margaret Thatcher (The Iron Lady) and more are examples of enjoyable and, perhaps, pertinent/memorable biopics as opposed to, shall we say, Howard Stern’s biopic Private Parts. 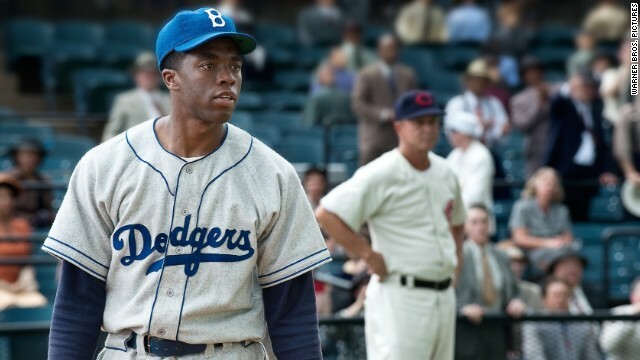 Hit the jump to read my thoughts on the newest Jackie Robinson biopic! 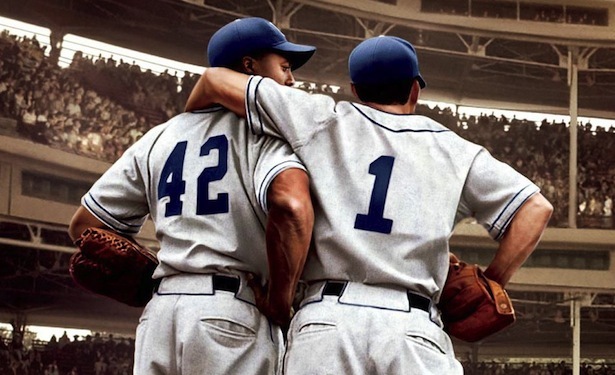 The latest theatrically released biopic entitled 42 is not the first Jackie Robinson biopic (Robinson himself actually starred in the 1950 film entitled The Jackie Robinson Story), but it is the more enjoyable one and deserves to be listed among other great biopics! 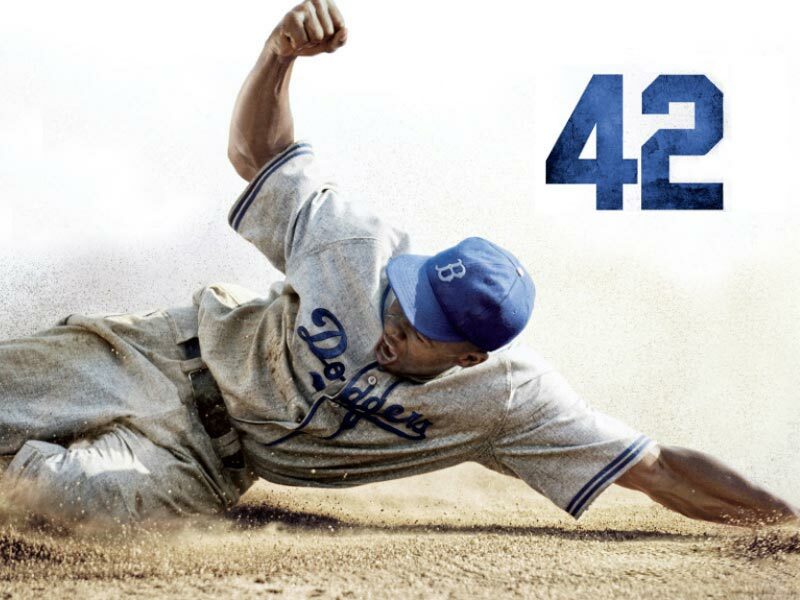 42 follows the story of famed baseball player Jackie Robinson who is credited with pioneering the breaking of the color barrier in professional baseball in the 1940’s. Just a man with a passion for the game, Robinson did not initially seek out to be a hero in a uniform, he simply wanted the opportunity to play baseball in the big leagues. The big leagues came with even bigger challenges personally, physically and professionally and 42, in a well-rounded way, shows how Robinson persevered together with the help of other important players in the whole scheme of things along the way. 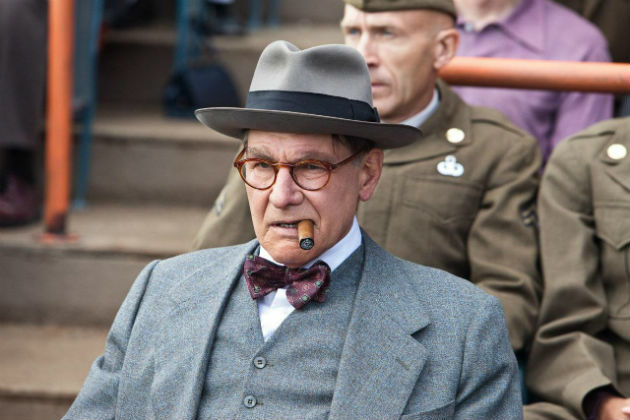 With an impressive cast including Harrison Ford in another role that easily makes the list of “Best roles played by Harrison Ford,” 42 utilizes it’s cast and characters to efficiently tell the story of all involved and the hardships endured. I really must pause here to give greater laud and appreciation for Harrison Ford in this role. Quite unrecognizable at the onset of the film he played a part that is not so common for him and he did it so perfectly. 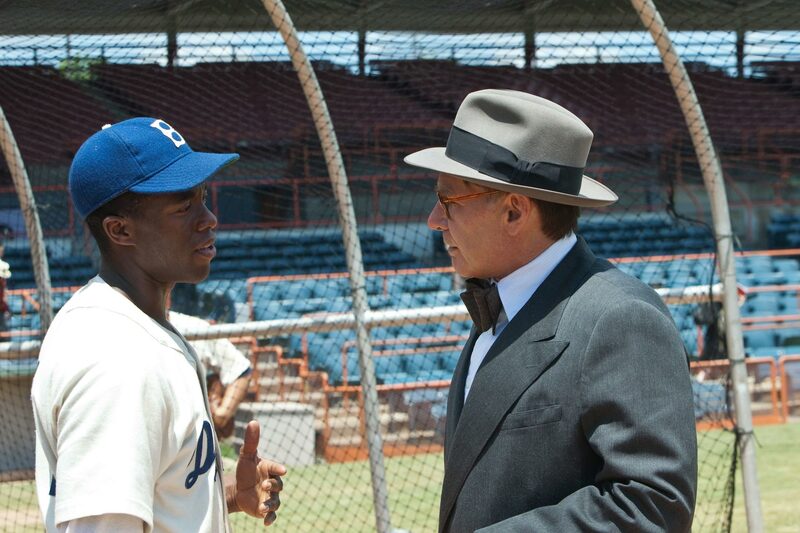 As the baseball team owner who pushed to see Robinson on his team for, arguably, multiple motives, Ford is the glue that ties the entire film together and provides the support for the story and for Robinson throughout. If this story wasn’t such a rousing film touching on elements of sports, racism, family and more…he still would be a fantastic reason to watch the film. The casting of Harrison Ford in his role is one of the best, by far, in a biopic. It has its staple characters (the antagonizers, the empathizers, the sympathizers, the analyzers and more), but each of them played their important role effectively. Boseman’s casting as Robinson is so perfect as well since his status as practically an “unknown” allows audiences to really buy into him as Robinson’s character. The character development brings out the relationships shared and the turmoils faced and steals the emotions from even the most hardened movie-watcher with ease, much like Robinson was known for easily stealing bases. Oftentimes, biopics tend to get tripped up with no sense of direction and fluff the story and screentime with superfluous scenes of war or sports or something else in order to eat up the time. 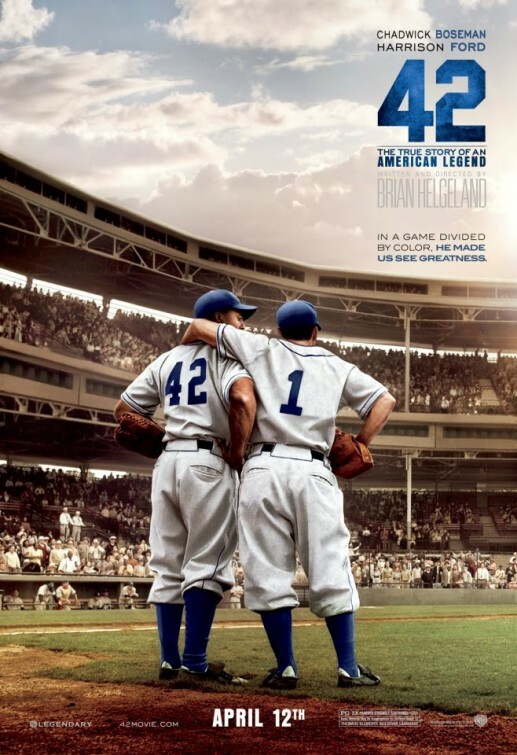 42 found its delicate balance and is not just “another baseball movie.” Reminiscent of films such as Remember the Titans where not only does a sport serve as the continuous backdrop to a story that revolves around striving for victory inwardly and outwardly, but it is also a story of triumph, issues of racial inequality, the unity of humanity and the vices used to drive us apart. A time period piece must be pertinent to the time of which it represents and be distinguishable as such. Throughout, I couldn’t tell if it was the 40’s or the 60’s. The time period-“appropriate” use of the N-word that probably rivals that of Django Unchained and will undoubtedly be the source of discomfort to some viewers. Its multitude of characters easily could have been confusedly mixed up, however it but does a great job with subtle identifiers enabling audiences to keep track of who’s who. 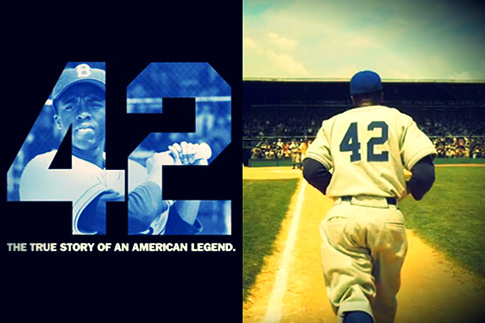 In the end, 42 is a winning biopic. 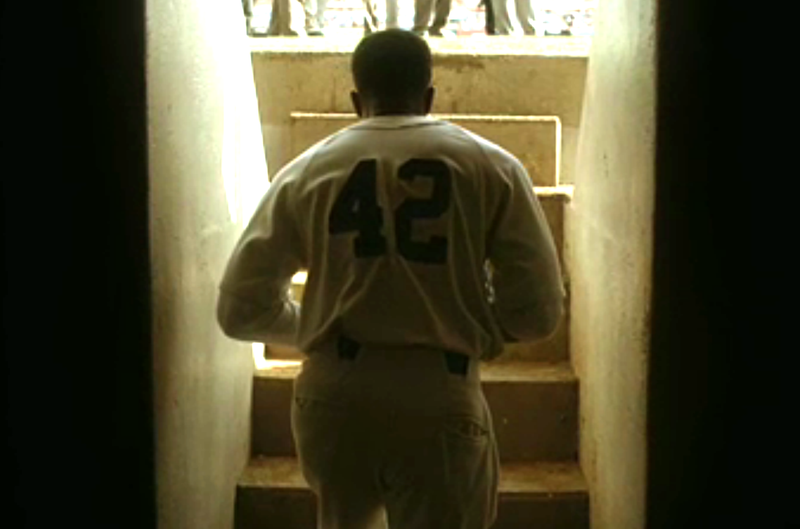 Jackie Robinson: A bold man with a bat became a giant beacon of hope to the world through his color-full fight for something much larger than himself and the baseball organization he played for on the field of the sport he loved so much. Wonderful look at this film. This was one that had my attention for months, and it didn’t disappoint. I took my kids and they were thrilled with it. Now I’m looking to take my wife and some friends to see this. I enjoyed it that much. I understand your quibbles, T. For me, the pacing and the subject matter fit and was treated with the respect it more than deserved. Thanks for this, and, too, for the shout-out, my friend. Oh, and if I have a quibble with the film it is that April movies get lost come awards time, I’m afraid. And Harrison Ford and Boseman (the more subtle of the roles, surprisingly), along with director/writer Brian Helgeland, deserve praise and nominations for their work here. It def is Julian. I look forward to your thoughts when you see it. A really good biopic with some great performances. Great review and thanks for quoting me. Great review, and I appreciate the linkage. I totally agree that this is probably Harrison Ford’s best role in years if not decades, even if I thought he was still a bit too recognizable at times (though it wasn’t nearly as obvious as it has been in some of his past roles.) I also agree that choosing Boseman, an unknown, for the role was a great decision that ended up really paying off. Thanks my friend. My pleasure adding your review in here. It’s always nice to see when you do that. Had to give some linklove back! Good review T. By-the-numbers and a tad corny at spots, but a very enjoyable movie that’s worth the look if you love Robinson’s story, like most do. Thanks for the link love as well! Thanks Dan the Man! glad to share your review too! You say the pacing is slow, but isnt that par for the course with biopics? And one of the reasons biopics are usually awful? I don’t know how minor that qualm is. Seems like a major one to me.